Weatherized enclosures don’t stop these versatile Bluetooth speakers from delivering surprisingly good musical performances. Earbuds make great travel companions when you’re traveling solo, but you need speakers to party with friends and family. Bluetooth has become the de facto standard for streaming music from smartphones and media players such as the iPod touch, and it can actually deliver relatively high-quality sound these days—provided the speaker you’re streaming to is up to the task. A portable speaker needs to be able to withstand getting knocked around, and it should also be able to resist damage from both liquids (from rain, poolside splashes, or being dropped in the snow) and solids (dirt and sand, for instance). The best way of knowing just how much exposure an electronic device can withstand is to determine its IP code (the acronym stands for International Protection Marking). IP codes are not mandatory, however, so if the manufacturer doesn’t provide that information (Fugoo does for its speaker; JBL does not for its Charge 2+) you’ll need to rely on the company’s description. JBL doesn't provide an IP code for its Charge 2+ speaker, but says it can be cleaned under running water from a faucet. Fugoo rates its speaker at IP67 and says it can be submerged for up to 30 minutes. Designing a speaker to withstand exposure to the elements is a tricky job that inevitably leads to some compromises in its ability to reproduce music. When it’s not done well, you end up with something like the sub-optimal TDK Trek Flex. When it’s done right, you get something like the JBL Charge 2+ and the Fugoo Sport reviewed here. If you like lots of bass, are working with a smaller budget, and don’t think you’ll deliver too much punishment to your portable speaker, JBL’s Charge 2+ is a really great product at $150. If you want a more balanced musical experience or want something that can withstand the elements—including being submerged in water for a short time—the more expensive Fugoo ($180, $200, or $230, depending on which enclosure you start with) is the device you’ll want. Read my hands-on reviews for more detailed analysis. In some respects, the Fugoo Bluetooth speaker is a much more ambitious product than the JBL Charge 2+ I’m comparing it to. When you perform certain actions, such as powering the speaker on, a male voice informs you that the speaker is on and whether or not it’s connected to a Bluetooth device. Like the JBL Charge 2+, you can use the Fugoo as a speakerphone, but the Fugoo can also harness your phone’s voice-recognition capabilities (Siri or Google Now). That gives you the ability to initiate calls with the speaker, not just receive them. You can use voice commands to perform other functions, too, although I didn’t delve deeply into this feature. Lastly, Fugoo offers a line of accessories—mounts, straps, and even a waterproof remote control—that can extend the speaker’s functionality. You can buy the Fugoo Bluetooth speaker in one of three increasingly rugged and weatherproof enclosures. The Fugoo Sport is shown here. The Fugoo is available in three configurations: Style, Sport, and Tough. All three models consist of the same speaker—or Core, in Fugoo speak—which you can remove and insert into either of the other two types of enclosures (Jackets), which are sold separately. Fugoo sent the speaker inside the Style jacket, but they also sent the Sport jacket so I could switch it out. Going by the speaker’s tight fit and finish, you’d never guess that you could pull out its guts and stuff them into a completely different shell. Getting the core in and out of its jackets can be an ordeal until you get the hang of it. I had trouble even after repeatedly watching the video on Fugoo’s website. Once I got the technique down pat, swapping jackets was easy. The core itself is not just weather resistant but waterproof: Fugoo rates it at IP67. The 6 means it can withstand a powerful jet of water and the 7 indicates that it can survive being submerged in water. Fugoo defines submerged as being in up to one meter of water for up to 30 minutes. The JBL Charge 2+ is rated to withstand only splashes of water (although you can clean both by running them under a faucet). The $30 Style jacket is the simplest and least rugged of the three, being fabricated of fiber-reinforced resin with a water-resistant cloth grill. The two-piece Sport jacket ($40) is made from much thicker resin and is wrapped with rubber trim to reinforce its corners and give it more impact resistance. Fugoo describes the Sport’s cloth grill as waterproof, and the shell has a mounting bracket to accommodate a variety of accessories. The $80 Tough jacket adds elements of aluminum to its construction and can be used with the same accessories (Fugoo sent a handlebar mount, but I didn’t test it). You can pull the Fugoo core out of one enclosure and slide it into another. Each of the three cases has three buttons on top: Volume up, volume down, and a multi-function button between those two that can pause playback and perform other functions, such as activating voice recognition. There’s a 1/8-inch aux input and a micro USB port for charging the Fugoo’s battery on one side (a cable and AC adapter are provided), and buttons for power and Bluetooth pairing are on the other. A blue LED glows to inform you when the speaker is powered on. JBL says the much larger battery in its Charge 2+ should last about 12 hours. Fugoo claims an astounding 40 hours of battery life (at 50-percent volume) for its speaker. I didn’t drain either device’s battery to verify the manufacturer’s claims, but the difference could be that Fugoo uses Bluetooth 4.0 where JBL is relying on the older Bluetooth 3.0 protocol. The Core has an active 28mm tweeter mounted on each side, and an active 39mm mid-range driver on each end. Passive 43x54mm passive radiators on each side help with bass response. The Fugoo’s much smaller interior space doesn’t provide nearly as much room for bass to resonate, and so it can’t begin to match the JBL Charge 2+ when it comes to bass reproduction. This unconventional speaker orientation is a little weird for producing stereo (Fugoo describes it as “360-degree sound”), but I found the Fugoo’s sound much more pleasing to my ears than JBL’s speaker was. Even the least-expensive Style jacket offers exceptionally good protection from the elements. In the early part of Steely Dan’s “What a Shame About Me,” from the band’s Two Against Nature album, the drummer drags his stick across a set of chimes. When I listened to it on JBL’s speaker, that ethereal shimmering sound was barely present. The Fugoo’s dedicated tweeter produced it almost perfectly, leaving its midrange to handle the guitar. In addition to having discrete tweeters and midranges, the Fugoo also supports the aptX codec, which I think delivers superior sound. Despite being smaller than the JBL Charge2+, the Fugoo delivered just as much volume. It can’t compete with the Charge 2+’s thumping bass response, but the smaller speaker sounded more musical to my ears. 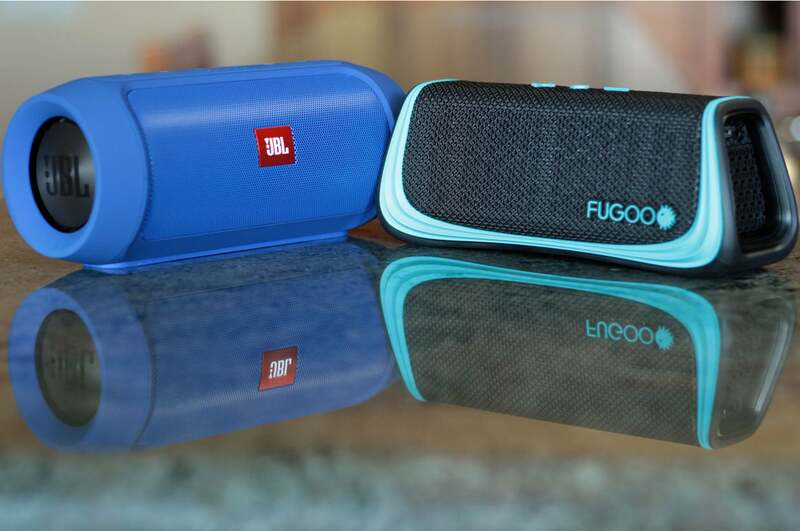 And if you’re looking for something rugged speaker in a small package, the Fugoo is hard to beat. It’s more expensive than the JBL, but you get more for the money. And that’s why I’ve given both speakers four-star reviews. The feature that sets the Charge 2+ is the pair of 2.0-inch passive radiators mounted at opposite ends of its cylindrical enclosure. These do exactly what you’d expect: Enable heaping helpings of bass to emerge from a speaker that’s just 7.25 inches wide. Play a bass-heavy track, and the gray brushed-aluminum discs atop those radiators really start dancing. The active drivers are a pair 45mm transducers mounted on either side of the JBL logo in the front of the enclosure. These produce a surprisingly good stereo image given the speaker’s overall dimensions. Some sound emerges from the back of the cylinder (there are grills on both sides), but I wouldn’t describe this speaker as omnidirectional. The JBL Charge 2+ weighs 1 pound 3 ounces, some of which can be attributed to its large battery. The Charge 2+ can operate either horizontally or vertically (three bumpers on the right-hand side prevent the rubberized enclosure from forming a seal against whatever surface it’s on when it’s sitting on end. A base on the bottom keeps the cylinder from rolling around when it’s horizontal, but I found it useful to roll the speaker back just a bit to point the speakers up toward my ears while I was writing this review (I positioned it behind my keyboard and in front of my display). Buttons with LED backlights on the top of speaker control the power state (on/off), Bluetooth connectivity, and the status of two special features: Social mode and speakerphone. Social mode allows up to three users to pair their Bluetooth devices to the Charge 2+. Pressing play on their device takes over the speaker until someone else presses play on theirs. This allows partygoers to share their music without physically sharing files. In speakerphone mode, you can take a call on your paired smartphone and use the Charge 2+ to hear your caller (the speaker has an integrated mic, so you can talk to the other person in hands-free mode). If you’re not operating the speaker in phone mode, pushing the speakerphone button pauses playback on the paired device. The volume control buttons are between the Bluetooth and Social buttons. These are easier to feel than see. They have elevated surfaces, but being the same color as the enclosure makes them blend in. Passive radiators at each end of the cylinder, combined with the speaker's size, enable the Charge 2+ to deliver considerable amounts of bass. Turn the Charge 2+ around and you’ll find three connections near its base: A micro USB port for charging its internal battery (an AC adapter and USB cable are provided in the box), an auxiliary input for making wired audio connections, and a USB Type A port that allows you to tap the speaker’s 6000-mAH battery to charge your phone or media player. Doing so will shorten the speaker’s play time, of course, which JBL claims is 12 hours. The current battery level is reported by five dot-sized LEDs that light up whenever you press a button. The Charge 2+ is protected by rubber-coated end caps. JBL doesn’t report an IP code for the speaker, but states in both its advertising and in the speaker’s user manual that it can withstand splashes of water and can even be cleaned with running water from a faucet. The manual warns, however, not to submerge the device or to leave it plugged in while you’re cleaning it. The ports in back are not covered, but they are recessed to provide a modicum of resistance to moisture. JBL doesn’t make any claims about drop resistance, but the speaker certainly feels substantial. I think the greatest risk of damage would stem from sharp objects making contact with the rubber diaphragm of those passive radiators. Listening to Steely Dan’s “Jack of Speed,” from their Two Against Nature release, I found it easy to forget that the Charge 2+ is equipped with just two 45mm transducers—and it wasn’t just because of the speaker’s strong bass response. The very first note is a strike of the drummer’s hi-hat, producing a high-frequency sizzle a fraction of a beat before the bass and then keyboard and guitar come in, and the Charge 2+ reproduced the sound surprisingly well. In addition to my near-field listening session in my home office, I also took the Charge 2+ into my home’s enclosed patio and then into my backyard. The audio broke up for about 30 seconds after I set it down on my patio table, at which point it was separated from my phone by about 35 feet and two insulated interior walls, but then it seemed to dial the signal in and it went back to streaming. That was the absolute outer limit of its range, though; it couldn’t maintain a solid connection to my phone when I moved it just a little further away. This is likely because the speaker is based on the older Bluetooth 3.0 standard. Plug in a USB cable and you can tap the Charge 2+'s 6000 mAH battery to charge your smartphone or media player. The speaker had no problem filling the 16x8-foot patio with sound, but I don’t know how well it would compete with a room filled with partygoers. Then again, it would probably be background music anyway. The speaker was also plenty loud in the more wide-open space of my backyard, especially when placed on a table against an exterior wall so that it could bounce some of its sound off that surface. JBL’s Charge 2+ is a fun, rugged, versatile, and well-priced portable speaker. It’s not an audiophile product by any stretch of the imagination, but it delivers good sound with a pleasing amount of bass wherever you happen to be. This fun, rugged, and reasonably priced portable speaker lets you take your music just about anywhere. Lots of companies makes claims about their products’ durability, Fugoo backs it up with an IP code. Better yet, this diminutive speaker delivers big and pleasing sound.